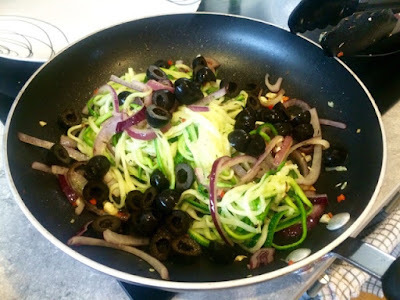 Courgetti, zoodles… whatever you want to call them… if you haven’t heard of these yet I can only assume you’ve been marooned on a desert island for the past few years. 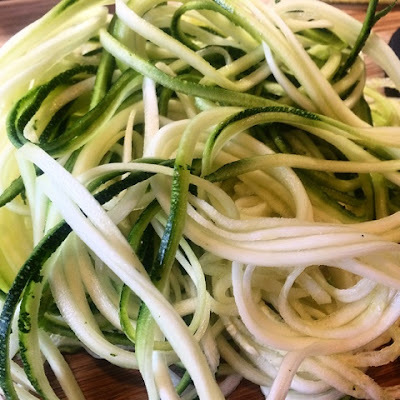 Courgetti is what you get when you spiralise a courgette (zucchini) using either a fancy spiraliser or a julienne peeler. This method of prepping the courgette turns the usually chunky vegetable into a big pile of noodles that closely resembles pasta and has therefore been adopted my vegans, coeliacs, 5:2 dieters and generally health conscious eaters across the globe as a substitute for spaghetti in pasta dishes. I’ve made courgette ribbons before using an ordinary vegetable peeler and love to use these in salads for packed lunches as a great alternative to leaves as they have more crunch. This is, however, the first time I’ve experimented with courgetti. The Boyfriend bought me this spiraliser gadget for Christmas and shamefully I’ve only just gotten round to using it. There are all sorts of different gadgets/utensils you can buy to do this, the fanciest being the kitchen worktop style ones like this very popular Hemsley + Hemsley one that will do all sorts of different shapes, down to the simplest julienne peeler. I quite like my middle ground one though as it looks just like a giant pencil sharpener, fits easily into my utensil drawer, not taking up valuable cupboard space and is easy and simple to use. One courgette gives you enough noodles for one person so get ready with the elbow grease if you’re cooking for a family of four or more! For my first attempt at the spaghetti substitute I decided to keep my accompanying sauce really simple. The combination of garlic, chilli, a little olive oil and a scattering of olives and herbs is simplistic pasta heaven for me and so this is what I went for. None of the ingredients were overpowering so that I could get a good taste of the courgetti and properly assess it as a pasta alternative. I’m pleased to say I was really impressed with the results. I’m a big fan of courgettes anyway so I really loved the overall flavour they bought to the dish. 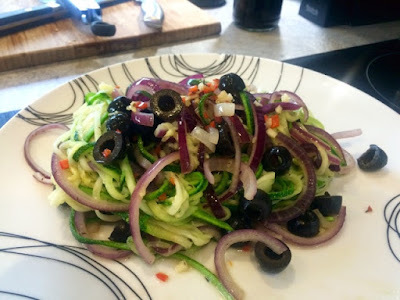 As an absolutely avid pasta fan my favourite thing about swapping it for the courgetti was that it allowed me to have a really nice big portion without the guilt or the bloating. Afterwards I felt satisfied but remarkably light as ordinarily, after this sort of meal, I would expect to feel stuffed. I think that using courgetti in the place of your pasta is an absolute no brainer if you’re looking for a gluten free option or looking to cut the calories of your favourite pasta dishes. I’m looking forward to trying it with a variety of different sauces now. I can definitely feel a low calorie quorn bolognese with courgetti recipe coming on. 1. 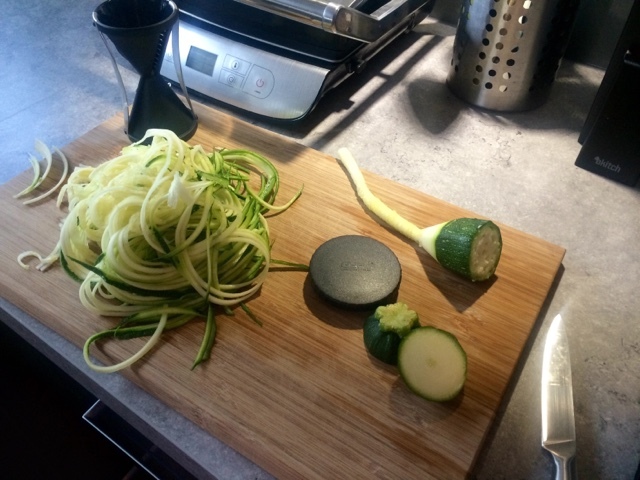 Use your chosen kitchen gadget to turn your courgette into noodles. 2. 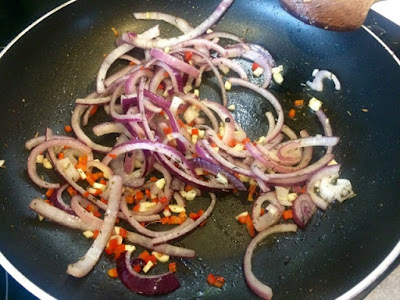 In a frying pan gently sauté the onions until softened then add the chilli and garlic, sprinkle of dried basil and continue to fry for a couple of minutes. 3. There are several ways of cooking your courgette noodles. Many people steam or blanche them or even have them raw. I find the quickest/easiest way for me is to put them in a colander in the sink and pour a kettle of boiled water over them. They take seconds to cook so they’ll be done almost instantly. 4. Drain the noodles thoroughly and add to the frying pan. Add the olives and mix everything together. Season well with salt and pepper. 5. Serve on a warmed plate for a not-pasta dish with all the satisfaction and none of the bloating!